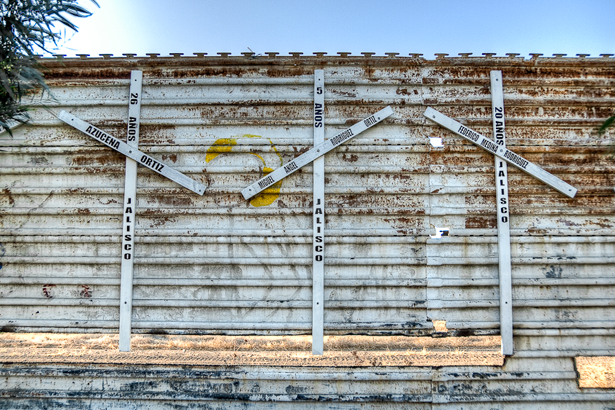 Community members cover the US/Mexico border wall with crosses bearing the names of the men, women and children who have died attempting to enter the United States. Photo by Dave Brewer. We built a shrine for him. A wooden cross, desert stone, rosary, and gallon of water mark where his body was found, thirteen miles north of the Mexican border in Arizona’s Sonoran desert, the deadliest migrant corridor of our southwest border. He may have stopped to rest, weary and sick from the walk north, and never woke up. Because only his bones remained, he is unlikely to be identified and his family will never know what happened to him. For two decades, the border between the United States and Mexico has been home to a crisis of migrant deaths. During that time, at least 6,000 people have died attempting to cross into the United States and many more have gone missing on the journey, never heard from again. Their deaths are a direct result of border militarization. In the twenty-six years since major immigration reform was last addressed, $187 billion has been spent on border security and immigration enforcement. The current attempt at immigration reform calls for an additional $6.5 billion for security operations and enforcement. While many progressives have accepted border security measures as the tradeoff for achieving immigration reform, we know that the terms of this compromise will be paid in blood. The foundation of US border strategy is “prevention through deterrence”: an approach that aims to make all aspects of unauthorized migration as traumatic as possible. Its mechanisms include drones, surveillance towers, border fencing, interior checkpoints and a small army of nearly 22,000 Border Patrol agents. However, this policy has failed to deter people from attempting to cross the border. Instead, it has succeeded in raising the death rate for those who try. As humanitarian aid workers with No More Deaths/No Más Muertes, we do what we can to mitigate the results of border policy in Southern Arizona. We hike the desert and leave food and water on migrant trails; we provide medical care to people we meet; and we search for those reported missing. We are torn by the prospect of the proposed immigration reform package going into effect. We want the 11 million undocumented residents of this country to gain security and a status allowing them to remain with their families. However, we are grimly aware of the destructive impact that billions more in border security funding will have. We see the impacts of border militarization on those we meet—abandoned and injured in the vast desert. Border Patrol helicopters hover over groups of migrants, causing them to drop their belongings and scatter in all directions. Guides push groups to move rapidly through areas surveilled by air and laced with ground sensors, leaving behind those who can’t keep up. In addition to making the border harder to cross, border militarization has also greatly extended the distance which migrants are forced to walk. Before the mid-’90’s, crossing the line might take a matter of hours. Today, migrants contend with 100 miles of enforcement, a zone that can take days or weeks to pass through. And still they try. As long as people have compelling reasons to leave their home communities and seek lives in the United States, they will continue to do so. Nothing in the reform bill addresses the “push” factors that drive northward migration to the United States. These factors include a series of free trade agreements (such as NAFTA and CAFTA-DR); US intervention in Latin American democratic processes and support for corrupt regimes; a war on drugs that has greatly enriched violent cartels; tolerance of human rights abuses by US allies that persecute indigenous people, women, queer and gender-variant people, and others who resist the destruction of their communities and land. For example, no reform measure addresses the fate of Central Americans who now make up a majority of crossers on some parts of the border. We have encountered an increasing number of Hondurans in the desert who are attempting to flee their country, which has the highest murder rate in the world. Their government was installed by a military coup, is infiltrated by drug cartels at all levels and is supported by US military aid. If they are apprehended, repatriation to their home country can be a death sentence. While the United States offers asylum to individuals who can prove credible fear of returning to their home country, Hondurans who apply for asylum have only a 7 percent acceptance rate. This suggests that the US is largely unwilling to admit to the political abuses of its regional ally. We have met individuals in grave medical condition who refuse to seek emergency care, aware that calling an ambulance will also bring them into Border Patrol custody and end in deportation. Increased border militarization places these individuals at higher risk of death. Furthermore, mass deportations and the criminalization of immigration offenses have denied many people the ability to enter the United States legally. During Obama’s first term, 1.5 million people were deported; if the current rate continues, 2 million will have been deported by 2014. Many deportees have lived in the United States for decades and have families, jobs and communities that await their return. In addition to risking their lives in the crossing, they risk being branded as felons if they are apprehended and prosecuted through a court program known as Operation Streamline. At daily criminal proceedings that take place in eight federal courts along the border, migrants are convicted en masse; those who have been apprehended more than once are sentenced as felons to jail time in the United States. While reform will bring new protections for those who have managed to stay in the country, it will further punish those who have been deported and now face a return journey through the deadly border region. Increased border security will not deter the movement of displaced people. Even with reform, the border will not be quiet. As humanitarians, neither will we. We invite you to join us in standing in solidarity with those affected by US policy in Latin American. As comprehensive immigration reform inches closer, we call on our country to end the strategy of border militarization. For more on the immigration reform bill, check out Aura Bogado’s blog. Catherine GaffneyCatherine Gaffney is a writer and activist living in Tucson. She is an active desert aid volunteer with No More Deaths/No Más Muertes. Kate Morgan-OlsenKate Morgan-Olsen is a human rights advocate and has worked on the border since 2010. She is an active desert aid volunteer with No More Deaths/No Más Muertes.